Marsascala is a modest sea-side village in Malta that has grown up around the small harbour at the head of Marsascala Bay, a long narrow inlet also known as Marsaskala Creek. The bay is sheltered to the north by Ras i?-?onqor, the south-east corner of Malta, and to the south by the headland of Ras il-G?ira. 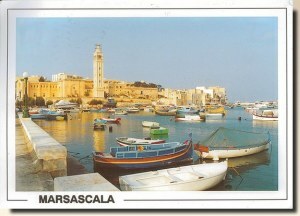 The name comes from the words "Marsa" (meaning "Port") and "Sqalli" (meaning "Sicilian"). The village extends along both sides of the bay, and across most of Il-?amrija, a creek leading to Il-Ponta tal-Gzira.